Scientific computing | Adam J. Sierakowski, Ph.D.
On Monday 14 March, I will present a seminar entitled “Numerical simulation of disperse particle flows on a graphics processing unit” at the Center for Compressible Multiphase Turbulence at the University of Florida. The seminar, presented at the Department of Mechanical & Aerospace Engineering, will take place at 15:00 in the Large Conference Room in the Particle Engineering Research Center. We will discuss the development and validation of a new open-source GPU-centric numerical tool for the resolved simulation of thousands of particles in a viscous flow in order to assist in the search for new closure models for reduced-order disperse particle flow simulation. The new tool, which achieves a throughput up to 90 times faster than its predecessors, implements the Physalis method to introduce the influence of spherical particles to a fixed-grid incompressible Navier-Stokes flow solver using a local analytic solution to the flow equations. We will consider some theoretical and numerical enhancements to the efficiency and stability of Physalis, and will visit two general classes of algorithms central to the effective utilization of a GPU for solving partial differential equations. To appropriately capture the unresolved particle interaction physics during collisions (i.e., lubrication and contact mechanics), we will discuss a new model that incorporates nonlinearly damped Hertzian contact. We will conclude by comparing simulation results to experimental data found in the literature and looking forward into the future of resolved particle simulation using heterogeneous high-performance computing systems. On Thursday 10 March, I will defend my PhD dissertation entitled Numerical simulation of disperse particle flows on a graphics processing unit. I will present my work in a seminar open to the public in 228 Malone Hall on the Johns Hopkins University Homewood campus at 10:30 am. In both nature and technology, we commonly encounter solid particles being carried within fluid flows, from dust storms to sediment erosion and from food processing to energy generation. The motion of uncountably many particles in highly dynamic flow environments characterizes the tremendous complexity of such phenomena. 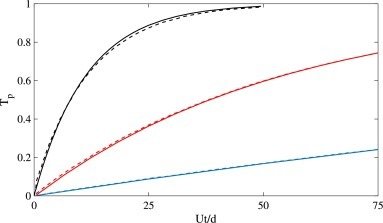 While methods exist for the full-scale numerical simulation of such systems, current computational capabilities require the simplification of the numerical task with significant approximation using closure models widely recognized as insufficient. There is therefore a fundamental need for the investigation of the underlying physical processes governing these disperse particle flows. In the present work, we develop a new tool based on the Physalis method for the first-principles numerical simulation of thousands of particles (a small fraction of an entire disperse particle flow system) in order to assist in the search for new reduced-order closure models. We discuss numerous enhancements to the efficiency and stability of the Physalis method, which introduces the influence of spherical particles to a fixed-grid incompressible Navier-Stokes flow solver using a local analytic solution to the flow equations. Our first-principles investigation demands the modeling of unresolved length and time scales associated with particle collisions. We introduce a collision model alongside Physalis, incorporating lubrication effects and proposing a new nonlinearly damped Hertzian contact model. By reproducing experimental studies from the literature, we document extensive validation of the methods. We discuss the implementation of Physalis for massively parallel computation using a graphics processing unit (GPU). We combine Eulerian grid-based algorithms with Lagrangian particle-based algorithms to achieve computational throughput up to 90 times faster than the legacy implementation of Physalis for a single central processing unit. By avoiding all data communication between the GPU and the host system during the simulation, we utilize with great efficacy the GPU hardware with which many high performance computing systems are currently equipped. We conclude by looking forward to the future of Physalis with multi-GPU parallelization in order to perform resolved disperse flow simulations of more than 100,000 particles and further advance the development of reduced-order closure models. I am happy to announce that I will be offering a new course for Intersession 2016 at Johns Hopkins University, entitled Applications in Scientific Computing (EN.530.390.13). The interactive two-credit course designed as an introduction to scientific computing for upper-level undergraduate students will take place from 4 through 22 January 2016. New graduate students are also encouraged to attend. As will all Intersession courses, Applications in Scientific Computing will be offered free of charge to students enrolled at Johns Hopkins University for the fall 2015 semester. All reference textbooks used for the course will be freely available online. Registration for Intersession 2016 opens 1 December. For more information, submit a comment below or contact me. Scientific discovery and computing capability have progressed inseparably for more than the last century, but few theoretically-focused courses find time to discuss this important connection. Guided by various examples borrowed from physics and engineering courses, we will interactively explore methods of solving problems numerically using contemporary computational tools. Example problems will draw from the following fields: dynamical systems, continuum mechanics, molecular dynamics, and robotics.